KIEV, Ukraine -- Ukraine's government kept up military pressure against pro-Russian rebels on Tuesday, threatening them with an "nasty surprise", while the militants said they were preparing to fight back after losing their main stronghold. Ukrainian paratroopers gather near the eastern Ukrainian town of Slavyansk, July 8, 2014. President Petro Poroshenko, drawing confidence from the fall of the rebel bastion of Slavyansk at the weekend, named a new chief of military operations in the east following his appointment of an aggressive new defence minister who again demanded the separatists lay down their arms. A security official said the government's plan to clear rebels from the two big towns of Donetsk and Luhansk would come as an "nasty surprise" for the insurgents. But Poroshenko - whose officials have ruled out any more unilateral ceasefires - kept the door open to a further round of indirect peace talks with separatist leaders, naming a possible venue in a government-controlled monastery-town in the east. Meanwhile, signs emerged of a split in separatist ranks over the fall of Slavyansk with a powerful field commander critically questioning the pull-out from the rebel stronghold. 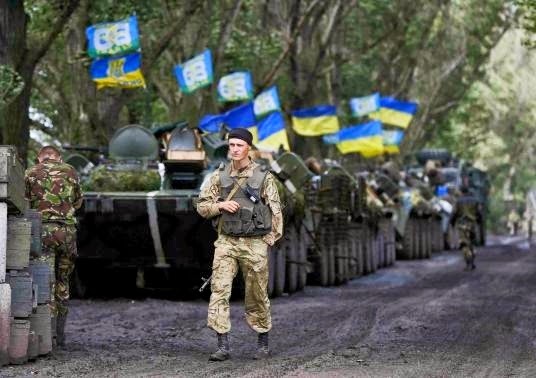 The rebels' loss of Slavyansk marks a major breakthrough in Kiev's three-month long fight against Russian backed separatists who are now calling in vain for military help from Moscow. "We're not preparing ourselves for a siege. We are preparing ourselves for action," Alexander Borodai, self-appointed prime minister of the self-proclaimed Donetsk People's Republic, told a Russian online newspaper during a visit to the Russian capital. Sporadic shooting was heard from parts of Donetsk overnight. In Luhansk, a city on the border with Russia where rebels also control key buildings, two people in a minibus were killed by a shell that exploded nearby, a municipal official said. "There is an exchange of fire among the separatists. They are shooting at each other," Iryna Verigina told a Ukrainian television station by telephone from Luhansk. Poroshenko, installed in office just a month ago, named Vasyl Hrytsak to head the "anti-terrorist centre", making him operational chief in the drive to crush the rebels. The move continued his shake-up of the military and security leadership in which he has appointed a hardline defence minister to bring fresh vigour to the fight against the insurgency. Hrytsak, a 53-year-old police lieutenant-general and 20-year veteran of the state security apparatus, replaces Vasyl Krutov, who had headed the "anti-terrorist centre" since mid-April. Despite some successes against the rebels, Krutov and other security officials have come under criticism for the patchy performance of the armed forces and big military losses including the downing by the rebels of an Ilyushin Il-76 plane in June with the deaths of more than 49 crew and servicemen. Pro-Russian rebels have been fighting government forces since April when they set up separatist republics in the Russian-speaking east after political upheaval in Kiev led to the ousting of a Moscow-backed president followed by Russia's annexation of Crimea. They have brought down military helicopters and ambushed government forces on the ground in three months of fighting in which more than 200 Ukrainian troops have been killed, along with hundreds of civilians and rebels. The fall of Slavyansk to government forces at the weekend has now swung the focus onto Donetsk, raising the question of how the Kiev military will go about breaking the resistance in a sprawling industrial city with a population of over 900,000. Security officials in Kiev gave away nothing about their military plans. "There is a plan ... under which we will be able to liberate these towns (Donetsk and Luhansk). "We are not publicising details of this plan. It should be a nasty surprise for the terrorists," he told journalists. At a meeting on Monday with Poroshenko, Donetsk mayor Olexander Lukyanchenko urged him not use air strikes or heavy artillery to crush the rebels. Ukraine's richest man, coal-and-steel magnate Rinat Akhmetov, made a similar appeal on Monday. "We have a population in the town now of more than 900,000 people minus those who have left. It's impossible to evacuate them and there is nowhere for them to go. Their security must be guaranteed via negotiations at all levels," said Lukyanchenko, according to his website. Since hundreds of rebels flooded into the city at the weekend, armed men have been out on the streets, setting up new barricades and checkpoints. Borodai brushed off suggestions that Slavyansk had been a defeat, portraying it as a successful tactical withdrawal, though Kiev says the rebels sustained heavy losses. Borodai, who also scoffed at talk of Kiev having resources to blockade Donetsk and Luhansk, said Igor Strelkov, a Muscovite who commanded forces in Slavyansk, would take over as commander-in-chief for defending Donetsk. But another rebel commander, Aleksander Khodakovsky of the so-called Vostok battalion - or eastern battalion - whose fighters also occupy positions in Donetsk was critical of the decision to pull out of Slavyansk. "Frankly speaking, we didn't believe them when we got phone calls saying they were leaving Slavyansk," he told a small group of journalists. "I hope Strelkov did not come here in order to go away," he said. "There will not be one single commander here ... because if Mr Strelkov suddenly chooses to leave Donetsk, with the aim of preserving the lives of the people of Donetsk and the lives of the volunteers, then we will not follow his order," Khodakovsky said. In the worst crisis between the West and Russia since the Cold War, Moscow has denied accusations of fanning separatism in Ukraine's east and allowing military equipment and fighters to cross into Ukraine to support the separatists. Though Borodai said he had been in "consultations" in Russia, many rebels now reproach President Vladimir Putin's administration in Moscow, which is under threat from further Western sanctions, for giving them too little help. The Ukrainian army's victory in Slavyansk has pushed peace talks involving separatist leaders off the agenda. But Donetsk's mayor, Lukyanchenko, said Poroshenko on Monday had proposed that a further round of talks, involving the so-called "contact group" and the separatists, should be held in the town of Svyatohirsk, north-east of Donetsk, which is the site of a 15th century Orthodox monastery.